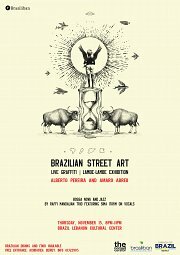 The Brazil-Lebanon Cultural Center (Brasiliban) has the pleasure to invite you to ‘Brazilian Street Art’ exhibition, set to take place on November 15th, 2018 starting at 8pm at Brazil-Lebanon Cultural Center, in Achrafieh. The ‘Brazilian Street Art’ exhibition is an art and educational project celebrating lambe-lambe (paste) and graffiti techniques, an initiative by the Brazilian art curator Sheila Zago (The Nomad Curator). The project aims to connect Brazilian urban art to Lebanon, Egypt and Syria. 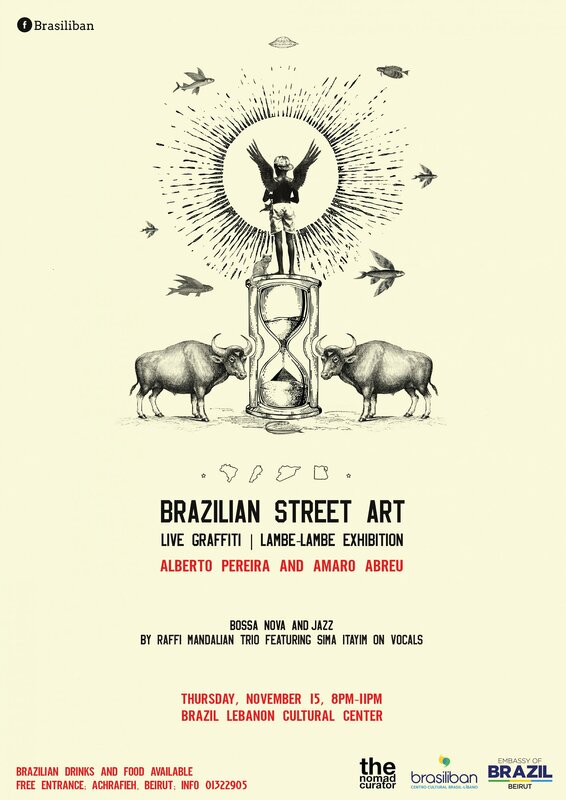 Alberto Pereira and Amaro Abreu, Brazilian street artists, are going to perform their street art live while the audience enjoys bossa nova and jazz played by Raffi Mandalian Trio featuring Sima Itayim on vocals. Alberto Pereira is a street artist born in Rio de Janeiro, Brazil. He creates images out of images, exploring contexts and giving new meaning to things, layers, weights and proportions. While he plays with images, the quest is to touch the hearts and minds of the viewer, making dozens of layers become hundreds of feelings. Alberto has participated in projects in Brazil and abroad, including street art festivals in France and Italy. Besides that, he has been developing projects on art expression and creativity at Casa Amarela Providência (Yellow House), inside the very first slum area in Rio de Janeiro (an initiative by the French photographer JR Artist, in collaboration with the Brazilian photographer Mauricio Hora). Amaro Abreu holds a degree in Visual Arts and he has been working with wall painting and urban art since 1998. Amaro has painted in Brazil, Argentina, Chile, France, Germany, Mexico, Paraguay, Spain and Uruguay - and he is now working in Egypt for the first time. He also has experience in the development of community projects, including working with Brazilian indigenous children and developing a project at Canoas central prison. In 2016, Amaro published his first book with his work and writings about his artistic journey (by Libretos Editora). Brazilian drinks, snacks & valet parking available. Come and join us for an amazing and new experience!